The Netherlands is in the middle of a full-fledged burger bonanza. It seems like there’s a cafe devoted to them on every corner, especially in Amsterdam. This means there’s a burger for nearly every taste, whether you’re a vegetarian or eat red meat with every meal. Here’s Brandon Hartley’s picks for a few of the best, weirdest, and wildest ones in the country. 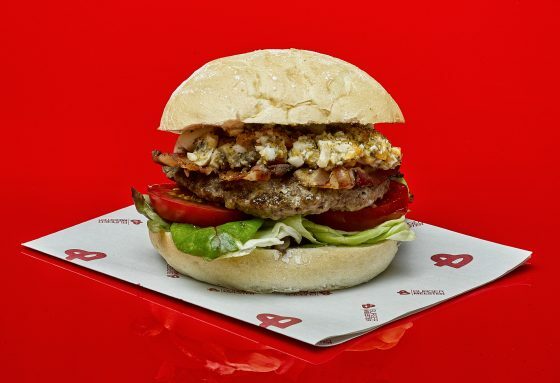 Since 2007, Burgermeester has specialised in a wide array of burgers. They now have four locations in the nation’s capital where you can enjoy ones with patties made out of everything from salmon to apples and cheese. There’s several beefy burgers too, of course, and they include the ‘Cheese Deluxe’ (Blonde d’Aquitaine beef, cheddar, jalapeños, pancetta, onions, and harissa mayo). Burgermeester also has a monthly burger. The one for March was a vegan option with a spicy falafel patty. If you can’t pick just one, try the Mini Trio, which features three pint-sized burgers of your choice. The burgers at this small chain tend to get so messy that they’re served on metal trays that catch everything that slips out of them. Ordering one also involves a lot of decision-making and there’s no telling exactly how many different combinations are possible (feel free to do the maths and let us know). Customers can try one of three different types of beef, which include a Kobe-style patty, that are minced in the kitchens each day. There’s also vegetarian options that include portobello or chickpea patties. Burger Bar also offers four different buns and four different varieties of cheese. Then there’s all the toppings, which include jalapenos, avocado, and even fried eggs. While you (probably) will never find any human burgers on the menu at any of these four disturbingly named cafes in Amsterdam, they do specialise in a few ambitious ones that could drive even a cow to do the unthinkable. In March, Cannibale Royale’s ‘Burger du Moment’ was dubbed ‘La Dinde et L’oeuf’. It featured a turkey patty, grilled pineapple, cucumber, yellow zucchini, homemade chili-tequila mayonnaise, and several other ingredients on a cheese onion bun with a fried egg proudly perched on the top. This burger and its predecessors usually stick around on the menu for a few weeks but permanent additions include the more traditional ‘La Classique’ and ‘L’Herbivore’, a vegetarian option with a patty comprised of beets, goat cheese, and lentils. Cannibale Royale also specialises in a variety of other meat dishes so there’s something to tempt the taste buds of even the hardest to please of bloodthirsty flesh-eaters. Needless to say, vegans should probably steer clear of these cafes, which feature macabre decor that wouldn’t look out of place in Wednesday Addams’ bedroom, and their grimly funny website. If you spent your teen years in America in the 1990s, Amsterdam was synonymous with three things: weed, tulips, and director Quentin Tarantino’s profanity-soaked and infinitely quotable Pulp Fiction. One iconic scene features Samuel L Jackson and John Travolta talking about Parisian and Dutch fast food burgers, which include the not quite accurate ‘Royale with Cheese’. 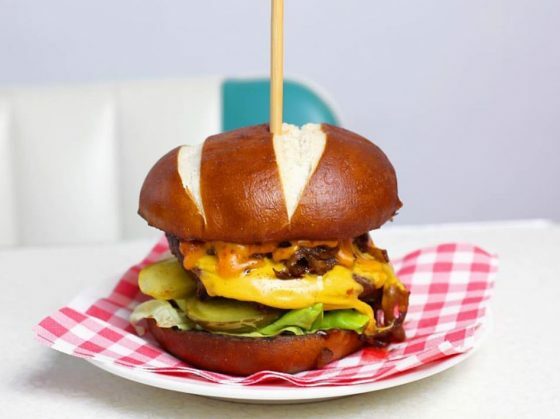 You can enjoy a tasty burger inspired by Tarantino at both of Rotisserie’s two cafes in Amsterdam. It comes with a double-beef patty, tomato, pickles, and sauce. There’s also the self-explanatory ‘Fried Chicken Bun’ and ‘Solid Veggie’, a vegetarian option served with broccoli. Rotisserie also has an impressive selection of gin and tonics in addition to a monthly burger as part of what the proprietors call ‘The Dynamic Burger Development Program’. The one for March featured both fake crab and fried chicken. Burgers that walk on the wild side? This eclectic restaurant, lounge, and club in Amsterdam’s red light district has been going strong since 1996 and it’s the home of Elvis, a remarkably unflappable cafe cat who can often be found slumbering in the dining room. It’s also known for its ‘Diva Dinners’ and ‘Fabulous Diva Burgers’ named for drag queens. One of the most recent additions is the ‘Aryelle Beef Burger’, named for the winner of the 2017 Amsterdam Drag Olympics. Chef Simon Parrott owns and operates this catering company, which features two food trucks that typically pop up at festivals. 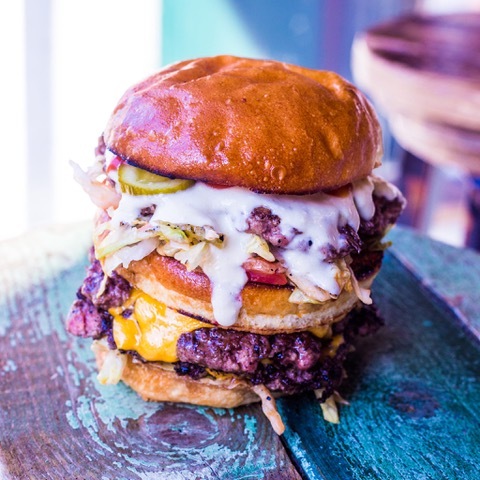 His highly-rated burgers, which often feature kimchi as a principle ingredient, can also be found at the Cafe Tapmarin in De Pijp and the Oedipus Taproom in Noord. He uses locally-sourced ingredients to create some of the best traditional burgers in the country along with a few unusual ones as well. Have a look at his Instagram account where you’ll find a recent goth-themed burger with a black bun. If this sounds like your sort of thing, check out the Beef Chief’s Facebook page to track down his schedule and learn where he’ll be grilling up perfection next. Contrary to what you might think at first glance, this super healthy burger isn’t made out of marijuana. Nevertheless, it’s proven to be a hit at the cafes and other establishments that serve them all around the country. Weeds are, however, the main ingredients. 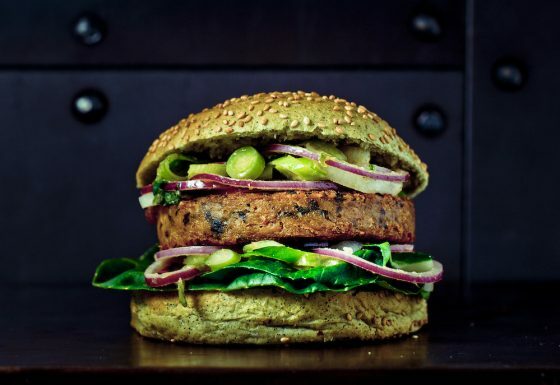 These burgers are seasoned with seaweed and the patties are made up of soy and Royal Kombu, a sustainably grown weed that’s harvested in the Oosterschelde National Park. Then there’s the bun, which is infused with Chlorella, a type of microalgae that’s typically used as a detoxifying supplement. You can learn more about the ‘Dutch Weed Burger’ (and where to find one) by visiting its website. ‘The Ter Marsch Grande’ earned Ter Marsch & Co Esquire’s award for Best Burger in Rotterdam back in 2015. It comes with Scottish Angus beef and several other toppings that include lightly-grilled Spanish onions, truffle mayonnaise, and farmhouse cheese. Two of their other burgers have won similar awards in competitions in Amsterdam and, believe it or not, Florida as well. In 2015, their crew nabbed another award for ‘Best Hamburger of the Netherlands’ at the World Food Championships over in America’s ‘Sunshine State’. ‘50s-style diners were all the rage in the United States and beyond back in the 1980s. Several of them are still in operation around the Netherlands. Gracy’s is one of the best and it’s down in Rotterdam. There you’ll find Grease playing on a loop on the TV behind the counter and milkshakes topped with enough whipped cream to replicate Marge Simpson’s iconic beehive hairdo. ‘The Amazing Gracy’s Burger’ comes with Black Angus beef and a stack of toppings along with the cafe’s signature Gracy’s sauce. This one and the cafe’s other burgers are also cooked on an ‘open fire’ Spanish grill-oven with a slow-cooking technique. Together, they landed on CityStyleGuide’s list of ‘Best Hamburgers in Rotterdam’ for 2017. This small chain in Utrecht serves artistinal burgers at their three locations (and a food truck) that come with familial names like ‘De Opa Harry’ and ‘De Tante Connie’. ‘De Mevrouw Smakers’ is a particular favourite and it comes with a spicy beef patty that’s served with grilled peppers, zucchini, jalapeños, and Secret Smakers sauce. Those who don’t like meat will likely enjoy ‘De Tante Lieke’, a veggie burger with a patty made of white lupin beans, carrots, and curry spices along with grilled peppers, cashew nuts, and mango chutney as toppings. Meneer Smakers’ location on the Oudegracht also features some rather unusual murals in the stairwell that leads to the bathroom on the first floor. McDonalds and Burger King stormed the shores of the Netherlands long ago but this popular stateside chain is a recent arrival. Its burgers are also much better than its fast food forebears. The ‘five guys’ in question are the five sons of a couple that started the franchise in Virginia in 1986. Since then, their burger empire has grown to over a thousand locations in North America. Regulars swear by the quality of their ingredients and their simple but complex menu. According to one estimate, it’s possible to create around 250,000 unique burgers out Five Guy’s various toppings. There’s also the milkshakes, which come in ten different flavors that include bacon, coffee, and salted caramel that can all be mixed and matched for the truly daring. This food cart has shocked and/or delighted plenty of attendees at Amsterdam’s annual Rollende Keukens festival over the years. It’s also received press attention from The Huffington Post, NPR, and other international media outlets. It’s because the duo that owns and operates it has filled their menu with meat from ‘unwanted’ animals that would otherwise be discarded following their deaths. These have included old horses, pigeons, crayfish, geese, coots, parakeets, swans, and even rats. 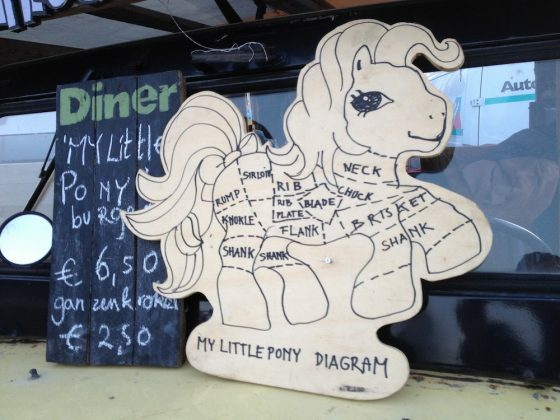 But their signature dish is ‘The My Little Pony Burger’, that is, yes, made out of ponies. It should go without saying that a stop at the Unwanted Animal Kitchen is *not* for the faint of heart. However, the entire point of the operation is to draw attention to humanity’s relationship with the animal kingdom and the often inhumane practises of the meat industry. You can learn more about the kitchen and the crew’s periodic dinner events by visiting their website.